It is possible to fit a towing bracket to the rear of the vehicle. between the centre of the ball coupling and the ground should never be lower than the measurement indicated when the vehicle is fully loaded including the maximum resting weight. • Driving with a trailer implies additional work for the vehicle. Therefore, before fitting a towing bracket, please contact an Authorised Service Centre to check whether your cooling system needs modification. • Observe the legal requirements in your country (e.g. the fitting of a separate warning lamp). • Certain vehicle components, e.g. the rear bumper must be removed and reinstalled. The towing bracket securing bolts must be tightened using a torque wrench, and an electrical socket must be used to connect to the vehicle's electrical system. This requires specialist knowledge and tools. 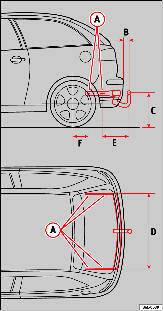 • The figures in the illustration show the dimensions and attachment points which must be observed if you are retrofitting a towing bracket. Towing brackets should be fitted by specialists. • If the towing bracket is incorrectly installed, there is serious danger of an accident. • If the electrical socket is incorrectly installed, this could cause damage to the vehicle's electrical system. For the sports model (FR, SPORT, CUPRA...), fitting of a trailer bracket is not recommended due to the design of the bumpers.